Kim Bolan is reporting that Skeletor received a 18 year prison sentence for cocaine trafficking. Finally. 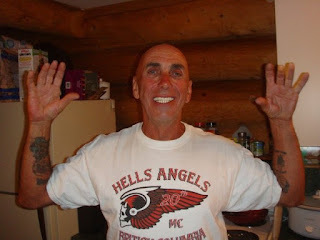 This is the long time member of the Hells Angels that was directly involved in numerous drug busts including the Western Wind drug seizure but always seemed untouchable. That's why I referred to him as Skeletor lord of the underworld. He looked just like him. I've been writing about him for a long time. People in Kelowna would send me pictures of him on a regular basis. I'm glad Postmedia News is a little more open with the sharing of pictures of known criminals now. I do believe that's in the public's best interest. I have on occasion used some of their pictures of criminals to raise public awareness. Likewise they regularly use this one of Giles from my web site. That kind of information sharing is in everyone's best interest. Giles was originally from the 13th Tribe and first became a member of the Hells Angels in Halifax. I wrote about his first stolen motorcycle that he received from the Lennoxville massacre. Members of the Hells Angels in Quebec wiped out one of their own chapters and gave him one of their dead brothers motorcycles as the spoils of war. That kind of selfishness and greed exemplified his tenure with the club. To understand the future you have to go back in time. Giles was caught on wire stating that his friendship is for sale and that he was only interested in friends that could benefit him and the club. That is what he was taught and what he learned from Mom Boucher himself in Quebec. I saw a picture of Giles beside Boucher when he got out of prison on the history channel. Still ugly as f*ck. Not like back in the day when he visibly looked like an active member of the Village people. They say Giles is terminally ill. That's too bad. What's worse is the disappointing legacy he has left behind. As Gladiator once said, what we do in life echos in eternity. Choose wisely. Peace. Read the article in the Vancouver Sun regarding his sentence and those of the other 2 men involved. One received 11 years and the other individual a much lesser sentence, the judge noting he had been hired as "labour". it also gave some history of Gilles childhood, which was less than ideal. Perfect e.g. of how a child is treated by the state can have long last effects. As an adult he certainly had choices, but his start in life sent him down an ugly road. Child treated by the State, the guy is a piece of garbage and his life attests to that fact. At some point when we become adults we have t take ownership for our choices. The State does not go around (or at least in the past, what the future holds is another thing altogether) taking children away from loving, providing households. When the state does take someone away, the removal does not make the person commit various atrocities. That would be like trying to claim all those who spent time in Boarding (Residential) Schools in Canada became criminals.